CLINIQUE FOR MEN exfoliating tonic 200ml, a gentle exfoliating lotion for normal to oily skins which helps control oil and maintain clearer skin. Part of the CLINIQUE FOR MEN 3-Step skin care program, the exfoliating tonic is used after a cleanser and before a moisturiser. Used daily to de-flakes and smooth the skin's surface to reveal clearer skin, unclogs pores and reduce oil buildup. CLINIQUE FOR MEN exfoliating tonic also prepares the face for shaving. Skin Type: Normal Skin, Combination Skin, Oily Skin. CLINIQUE Skin Type: Type 1, Type 2. CLINIQUE Men's 3-Step: Step 2. Previously called CLINIQUE skin supplies for men 2.5 scruffing lotion 200ml. 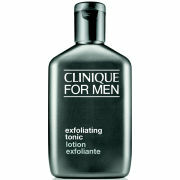 CLINIQUE FOR MEN exfoliating tonic 200ml was found on 1 website and could not be price compared using EAN: 0020714104726. The cheapest CLINIQUE FOR MEN exfoliating tonic 200ml is shown as the main item, prices range from £17.50 to £17.50, excluding delivery. Price comparison based on price and delivery charges, with any valid discount codes being applied, is shown in the table above. Prices and information correct at the time of publication.